Bimkom engages in on-the-ground work with local communities. We assist Palestinian communities in promoting viable solutions to their specific planning problems, including offering workshops to teach residents, both women and men, about their planning rights and the ways to actualize them. We build residents’ capacities to advance adequate solutions to specific planning problems and needs that exist or emerge in their neighborhood. Bimkom attempts to identify opportunities within existing plans for promoting the construction and/or maintenance of infrastructure and public facilities. For instance, we may identify plots designated for public building (such as schools, kindergartens, mother-and-baby clinics) which were never implemented/realized within the existing plans for Palestinian neighborhoods. These types of identifications help enable the construction of services based on existing plans as opposed to waiting for a new plan to be prepared. Bimkom also advocates for implementation and development, jointly with the residents. Bait Safafa: Located in southern Jerusalem, Beit Safafa, along with the adjacent Sharafat neighborhood, is not contiguous with the other Palestinian neighborhoods of East Jerusalem. Before being included within Jerusalem’s current municipal borders, Beit Safafa was an independent agricultural village located to the southwest of Jerusalem. At the end of the 1948 war, the Green Line was drawn through the northern part of Beit Safafa, splitting the village into two; the (smaller) northern section became part of the State of Israel and its residents were granted Israeli citizenship, while the southern section of the village came under Jordanian rule. After the 1967 war, the village was reunited, this time under Israeli control, and the residents of the southern part of the village received permanent residency status. Beit Safafa retains its rural character to this day, with relatively low buildings and agricultural plots between the houses. However, the neighborhood has seen population growth since the 1980s due to inward migration. Today more than half of the Palestinian-Israelis living in Jerusalem’s Palestinian neighborhoods live in Beit Safafa. Beit Safafa’s proximity to the more adequate infrastructures and services of the neighboring Jewish-Israeli neighborhoods and to the industrial and commercial zone of Talpiyot increases its desirability in comparison to other Palestinian neighborhoods. 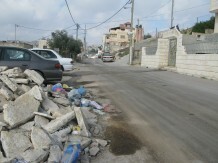 Today, the most troubling issue for residents of Beit Safafa is the construction of Road no. 4 South which will run through the heart of the neighborhood from northwest to southeast, splitting the neighborhood and severely damaging the resident’s fabric of life. This stretch of highway, Road no. 4 (commonly known as Begin Road), will complete the North-South bypass route of the city, providing residents of areas to the north and south of Jerusalem quick access through and beyond the city. Preparations for implementation of the highway entailed the expropriation of large swathes of private land from the residents of the neighborhood. Besides being of economic significance for the residents, the area is also an important land reserve for the potential alleviation of the housing shortage. Road no. 4 South is yet another layer in the network of roads that runs through the area of the village while primarily serving residents of other neighborhoods. According to the permits, Road no. 4 South will be dug like a canal, with only a few crossing points. The residents of the neighborhood requested to have most of the highway covered so as to salvage the continuity of the neighborhood and the connections between residents on either side of the transportation artery. Their request was rejected and only a small section will be covered. Alongside the damage to the village as a whole, the highway will also harm specific populations, among them the students of the neighborhood high school, who will have to travel all the way to Gilo and back in order to reach their school on the eastern side of the village. It is important to note that while the detailed planning of the highway was never completed, its implementation has already begun. The residents have appealed to court regarding the legality of the road simultaneously mounting a public protest campaign.